3 legged tubular pipe frame-work, mounted on 50mm dia. anti-static rubber wheels. Supplied with one stainless steel basin. - Stainless Steel Frame & Basin. - 5 legs base mounted on 5 cms dia castors. - With 2 Approx 35 cms S.S Basin. - Basin holder SS tube made of 16mm x 18G. We are offering a wide range of Wash Basin Salon Stand. 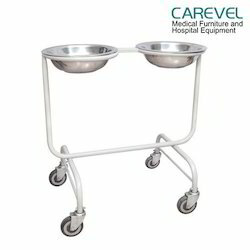 As a quality focused firm, we are engaged in offering a high-quality range of Hospital Wash Basin Stand. - Five legs base mounted on 5cms dia castors. - With one appox.35cms dia S.S.basin. - Vertical MS tube made of 25mm x 18G. - Basin holder MS tube made of 16mm x 18G. Our organization is among the reputed names in the market for providing a wide range of Hand Wash Basin Stand (Double). Our products are available in different designs and patterns as per client’s requirements. 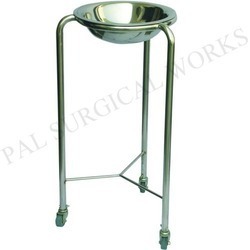 Apart from this, these stands are used in hospitals and clinics. With prosperous industry practice, we are known to offer Double Wash Basin Stand. It is made by experts using the advanced technology. According to the needs and prerequisites of our customers, we are included in giving Hand Wash Basin Stand. - Pre- Treated and Epoxy Powder Coated.